One of our favorite holiday events is the annual Christmas cookie party. Each of our girlfriends brings a recipe, and we bake cookies together all afternoon. 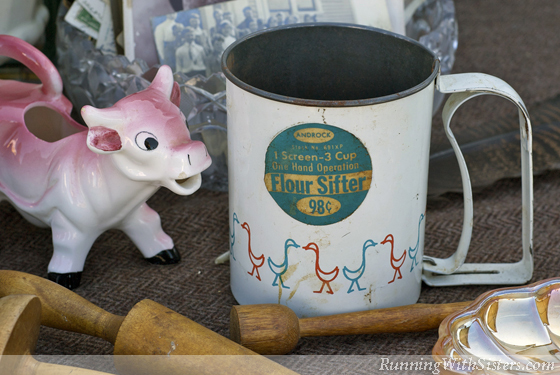 So with the party in mind, we decided this trip to the flea market would be all about cookies! 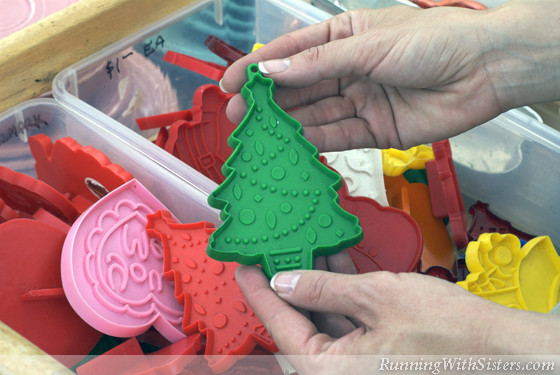 After passing several stalls of books and hardware, we found the cookie cutters! 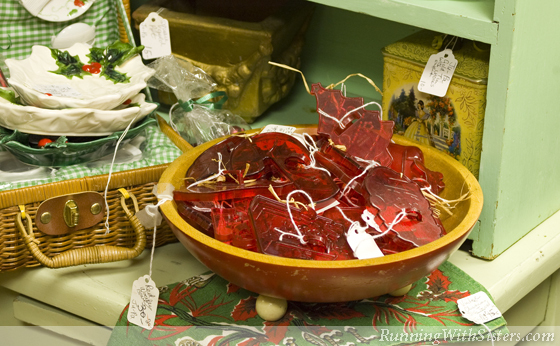 Kitty rummaged through a bowl of tin ones for Jennifer’s reindeer. Only $2! 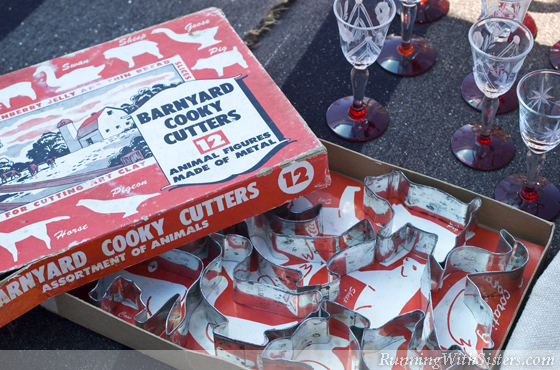 Meanwhile, Jennifer rounded up a herd of barnyard animal shapes for $8. After the party, she’s going to hang them on the tree as ornaments. A few booths down, we spotted another cookie press. This one had no box, just a big Ziploc bag, and the seller wanted only $6. Deal! Across the way, we discovered shoeboxes of sewing patterns and got the idea to make vintage aprons for the party. We bought a McCalls pattern from the fifties that makes both a bib style and a half apron. No matter how the cookies turn out, we’ll look sweet! The highlight of our day was finding a 1959 Better Homes and Gardens Holiday Cookbook. We laughed at a kooky picture of Popcorn Christmas Trees made of frosted ice cream cones rolled in popcorn. Only in the Fifties! We gasped when we saw our favorite Pepparkakor in there, which we thought was a secret family recipe. Guess not, Mom! It was the Rosette Cookies that convinced us to buy the book. They were made by dipping a flower-shaped iron into batter, then straight into hot oil. Fried dough fancy enough for company! We knew these were going to be the hit of the party. 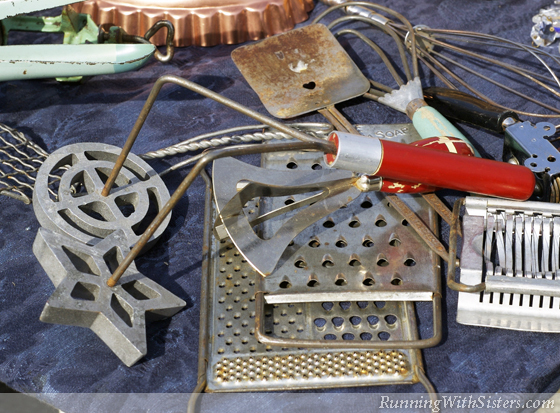 Now to find a rosette cookie iron. Good thing we like a quest! Kids have been caught with their hand in McCoy cookie jars since the 1940s. 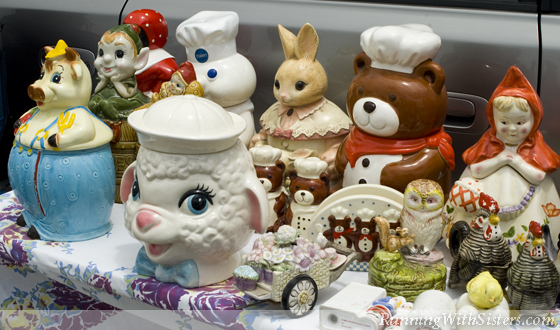 Nowadays, these stoneware bears, clowns, and lambs can be seen at flea markets everywhere. 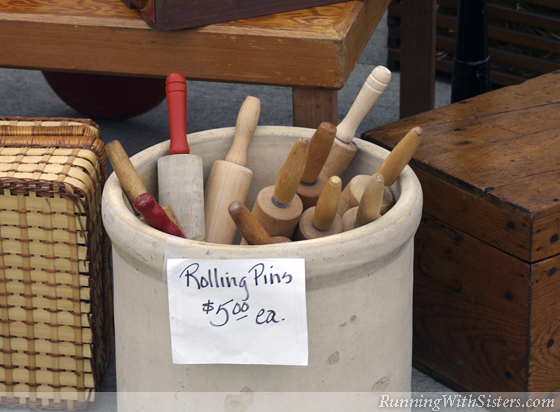 But buyer beware—many are fakes! Serious collectors have encyclopedic knowledge of which jars were produced, how tall they should be, and even how much they should weigh. But if you aren’t an expert, trust your taste. If you love the cookie jar and the price is right, go for it. Once you fill it with Snickerdoodles, no one will care if it’s a real McCoy!